The solar cycle is an 11-year cycle of magnetic change on the Sun. It's primarily looked at in terms of sunspots. When you have a minimum number of sunspots we call that solar minimum. Then you go through a period where there are more and more sunspots on the Sun, you see an increase in the number, greater and greater as you go along until about five years after minimum you have a maximum number of sunspots. A lot of change on the Sun, a lot of evolution. Then after this maximum, it decreases again and you get less and less sunspots and you go back down to minimum. During maximum is when you have the most flares and the most magnetic activity. Another interesting thing seems to be associated with that, is that the Sun goes through an 11-year cycle, maximum, minimum, maximum, minimum. There were two periods that we know about back in the middle 1600s and early 1500s when the sunspot cycle seemed to have stopped. Let's say there were no maximum, no minimum. The Sun was just sitting there. During those times in Northern Europe there were many ice ages. The climate on the Earth had changed and Northern Europe was colder during those times. We have no idea why that happened. We also have no idea what causes the sunspot cycle. 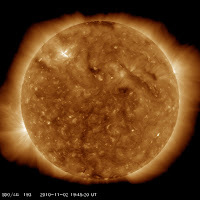 We have an idea, we're beginning to get an idea of what causes sunspots in terms of the turbulence and the interface between the core of the Sun, or the radiative zone, we call it, and the convective zone, which is, say, about a third of the distance from the top. There seems to be a shear there and there is turbulence as the Sun rotates. The Sun rotates at different velocities at that area, and that seems to cause the magnetic field. But why that changes with time, we have no idea at all. Source of the picture : Atmospheric Imaging Assembly (AIA) for the Solar Dynamics Observatory (SDO) is designed to provide an unprecedented view of the solar corona, taking images that span at least 1.3 solar diameters in multiple wavelengths nearly simultaneously, at a resolution of about 1 arcsec and at a cadence of 10 seconds or better. The primary goal of the AIA Science Investigation is to use this data, together with data from other SDO instruments and from other observatories, to significantly improve our understanding of the physics behind the activity displayed by the Sun's atmosphere, which drives space weather in the heliosphere and in planetary environments. Solar activity is driven by the evolving magnetic field. Although the coronal magnetic field cannot be measured directly, much of the magnetic field within 10^5 km from the surface contains hot plasma that is dense enough to emit detectable levels of light. This plasma is (mostly) frozen onto the field lines, so that the emission from (or absorption by) the plasma outlines the magnetic field. The coronal plasma has a wide range of temperatures, emitting brightest at EUV and soft X-ray wavelengths. A suitably designed imager with narrow thermal responses, such as the AIA, can use these contrasts to dissect the corona into complementary sets of high-contrast images for further analysis. Please note the above information is the same for AIA 304, and AIA 171 .